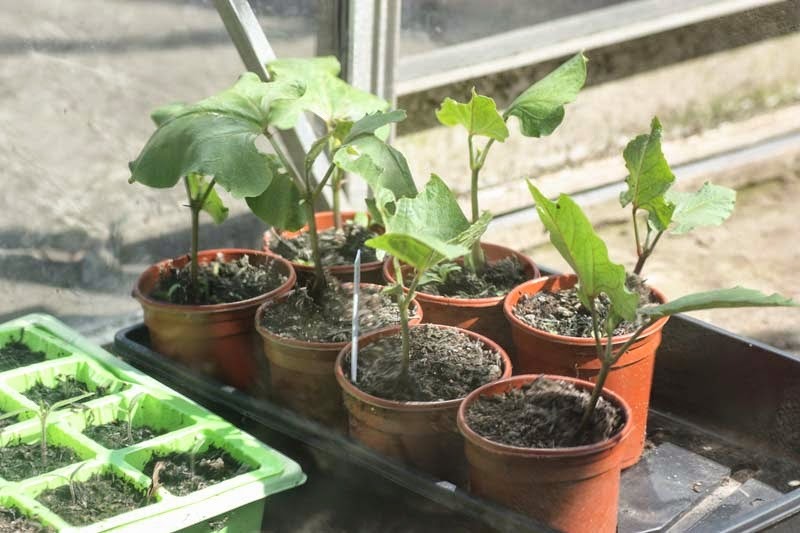 My rhubarb is growing fantastically well. I've got a few ideas of what I would like to do with it when it comes to harvesting, but one of the very first dishes I will be making is what has become a firm in our home - Celia's Rhubarb and Lentil Curry. 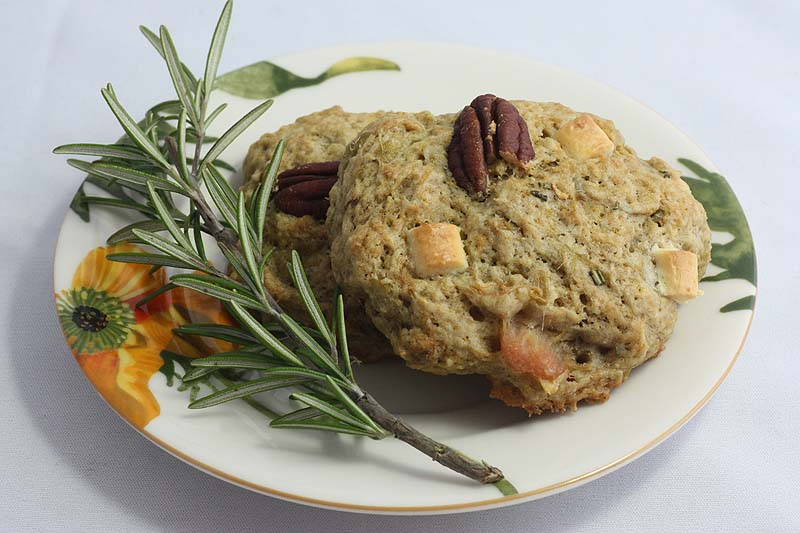 For the recipe follow this link. The recipe is vegan, but we like to serve it with a dollop of natural yogurt on the side. 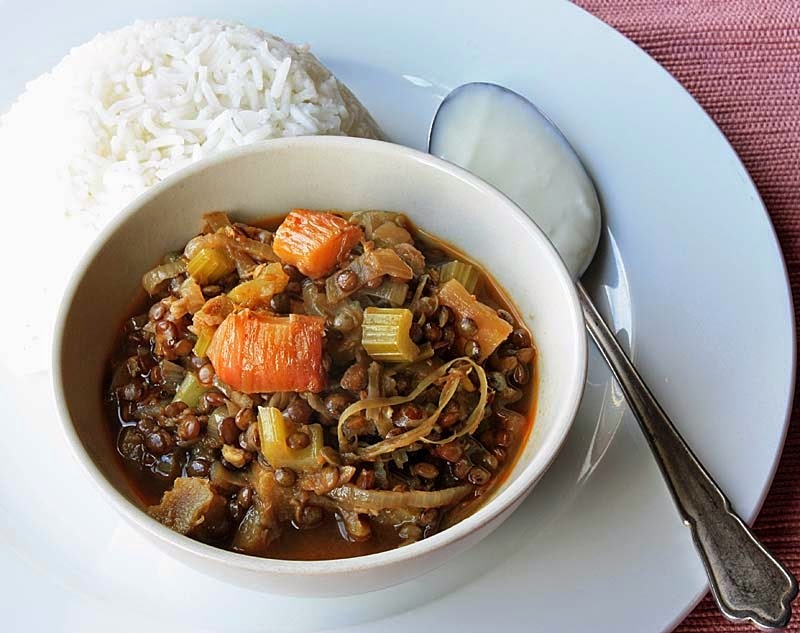 I am sharing Celia's Rhubarb and Lentil Curry because I think it is worth sharing with Jacqueline of Tinned Tomatoes for this months edition of Bookmarked Recipes #32. 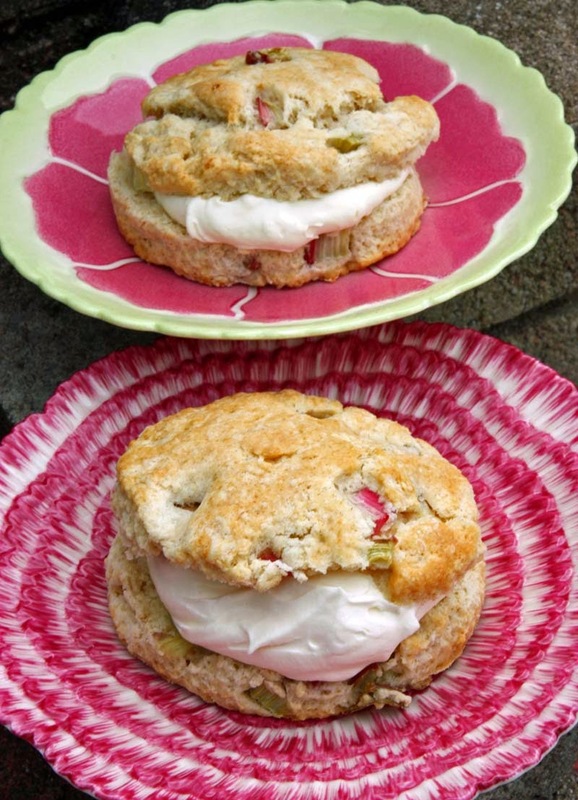 Anyway, what will you be making with rhubarb?! Come on, please share some rhubarb inspiration. I am always looking to try some new rhubarb sweet and savoury recipes. Here's some to inspire you. One of the most popular recipes on my blog that has inspired fellow bloggers to create their own combinations was this Rhubarb and Rose Petal Butter, closely followed by Rhubarb and Hibiscus Butter (pictured above). 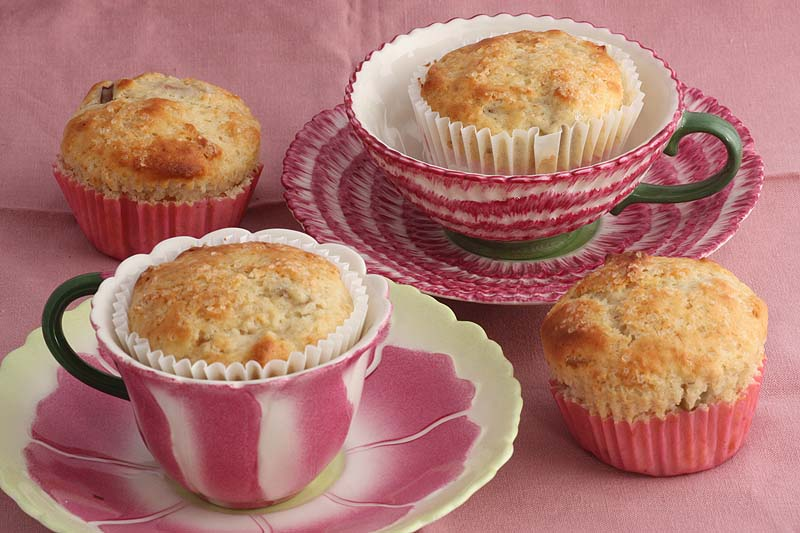 Rhubarb and Ginger Muffins in some of my treasured and cherished teacups and saucers. 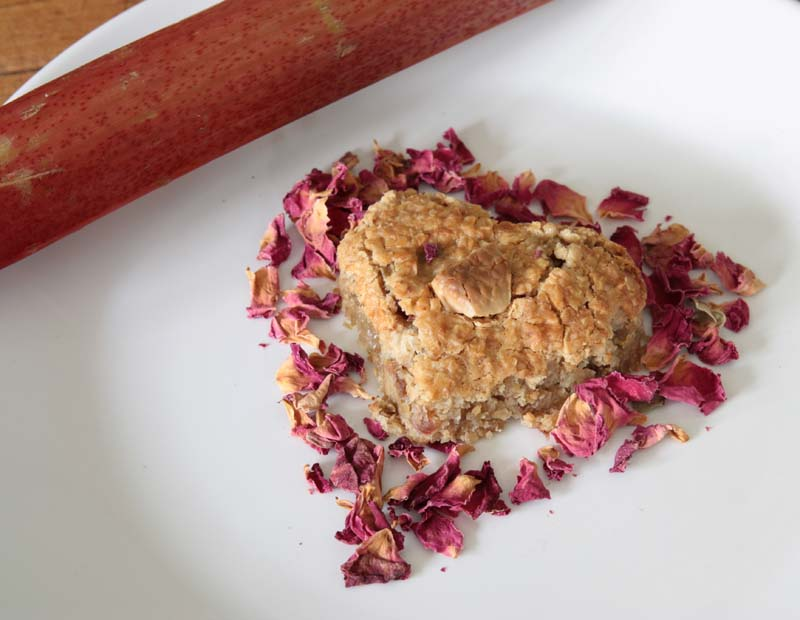 Rhubarb, Rose Petals and White Chocolate Flapjacks cut out in a heart shape. 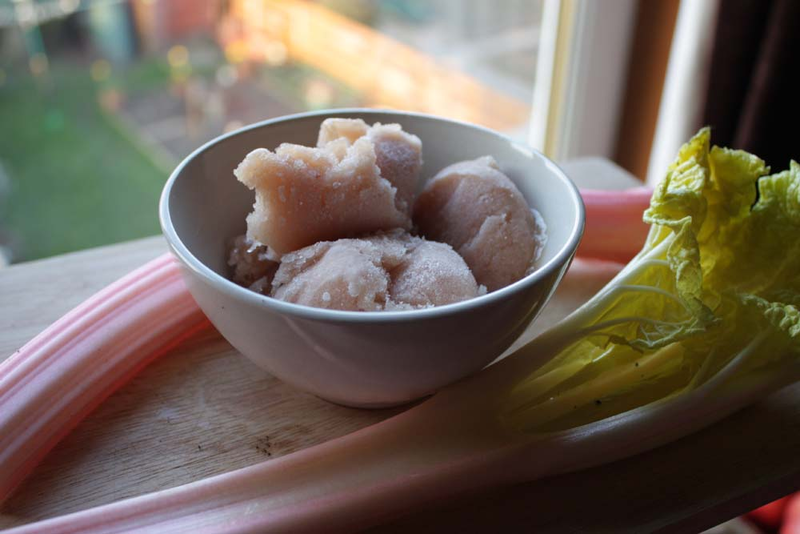 Pink Rhubarb Sorbet - one of the very first Rhubarb recipes to feature on my blog. Many of you know that I have not been buying any cookbooks due to lack of income, and have been borrowing books from my library for the past couple of year. I am patiently waiting for Jack Monroe doesn't seem to have hit the bookshelves there yet, unless some eager beaver already has his/her mitts on it. I've been told it has a lot of vegetarian recipes, so I am keen to flick through its pages. 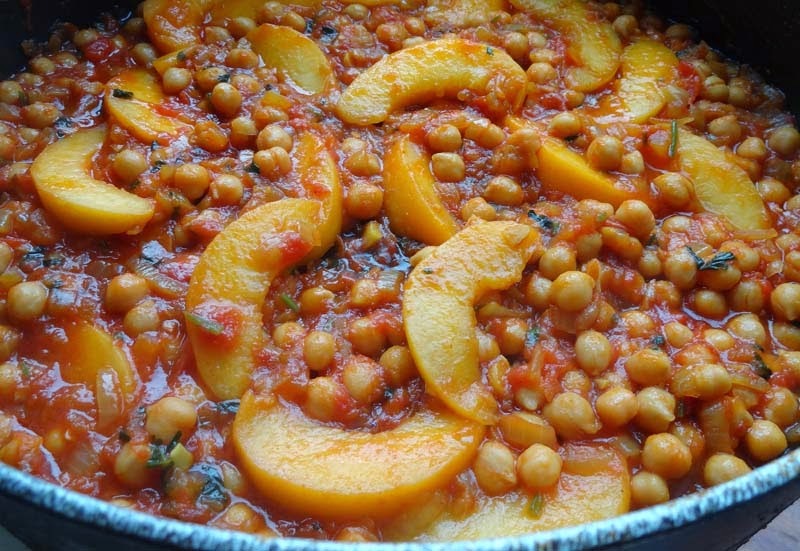 But I am a little impatient, as the one recipe I have been hearing a lot about is the Peach and Chickpea Curry and its got me excited of sorts. One of my weekly university student budget standby dishes would be a Chickpea Curry with white rice. I would often bulk up the Chickpea Curry by adding another vegetable, mostly a green veg like broccoli or a leafy green like spinach. The last time I made a variation of Chickpea Curry was not too long ago, when I was experimenting with wild garlic and made a pot of Wild Garlic Chickpea Curry. Well this recipe is that very same recipe, except for a couple of changes. In place of butter I have used vegetable oil and instead of adding the wild garlic towards the end, I have tossed in slices of peaches including its juices. I was never a fan of sweet and sour or even spicy combination, but over the years my palette has been more welcoming. 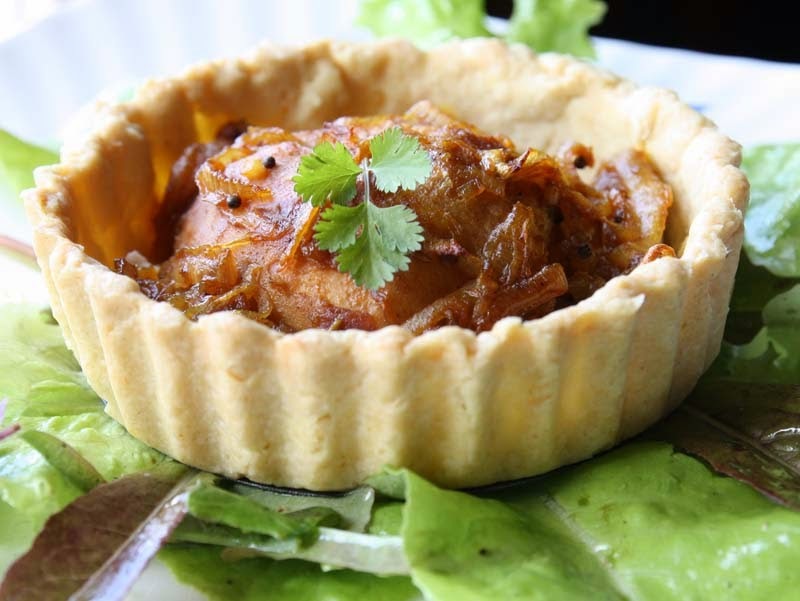 I've had curry dishes with hunza apricots, raisins and sultanas, but never peach, saying that though I did make Curried Peach Tartlets a while back, but I wasn't that keen on it. This however, I thoroughly enjoyed. I am also pleased in the knowledge that I ate some fruit (albeit from a tin). I am very good at eating my vegetables, but terrible when it comes to fruit. 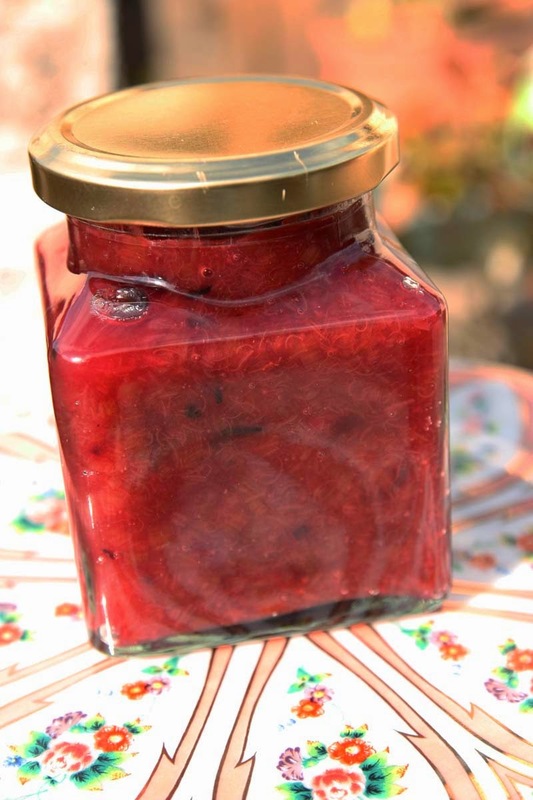 Tinned fruit might be the way to go for me, well at least in the autumnal and winter seasons. 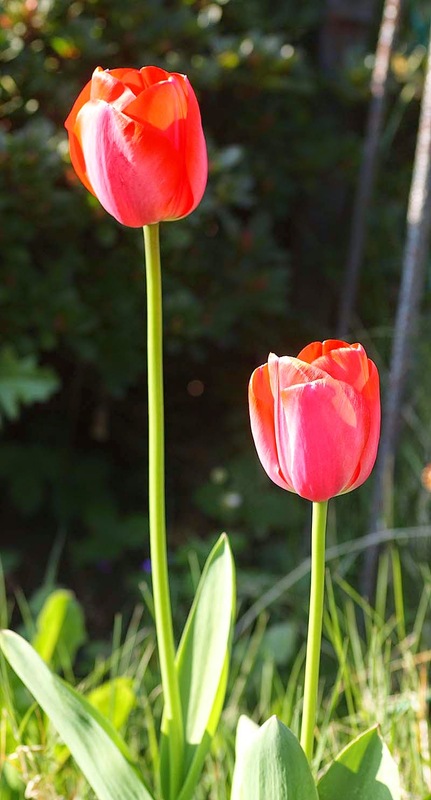 I was hoping to do a bit of gardening today, but its been rather nippy and breezy that I did not wish to stay out in the garden too long, I fib, at all in fact and was chased back to the warmth of the indoors. Its been a rather lazy day, really. But instead of sitting in front of the computer catching up with blog reads (namely because the Internet has been temperamental), I've been sitting watching DVDs, flicking through cookbooks for inspiration and listening to music. Food has been a lazy affair too. 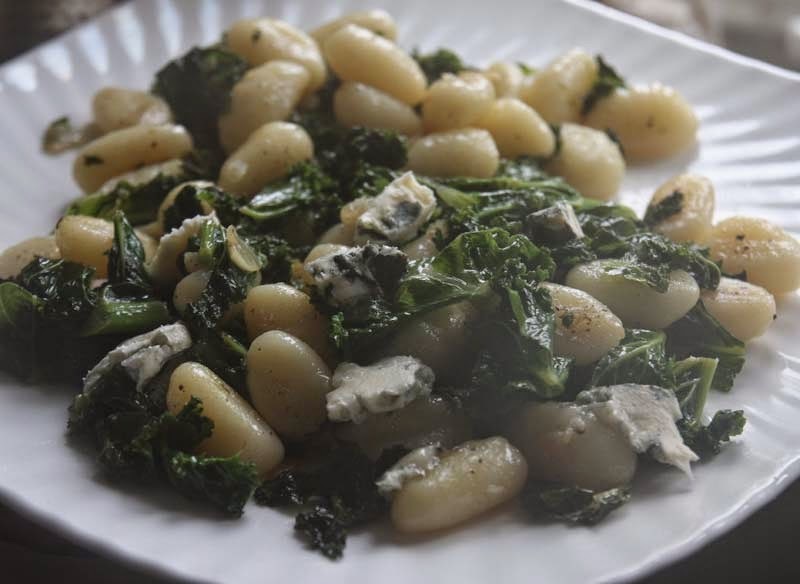 Pan fried gnocchi with sauteed kale topped off with some Gorgonzola cheese. 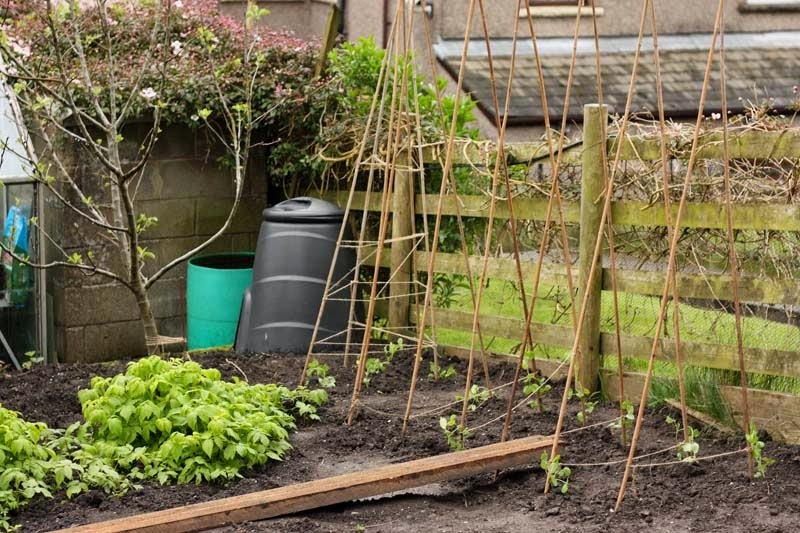 Here's hoping tomorrow will be a better day and we can get some work done, like build those wigwams for the the sweet peas to start climbing up. Since my culinary adventure came to an expected end, I did not completely turn away from the local food scene. I have a food stall at selected food markets. I have been keeping a foot in partly to stay focused and partly to earn a little income whilst hunting for full-time employment, but truth is I barely break even, still it keeps me distracted of sorts. 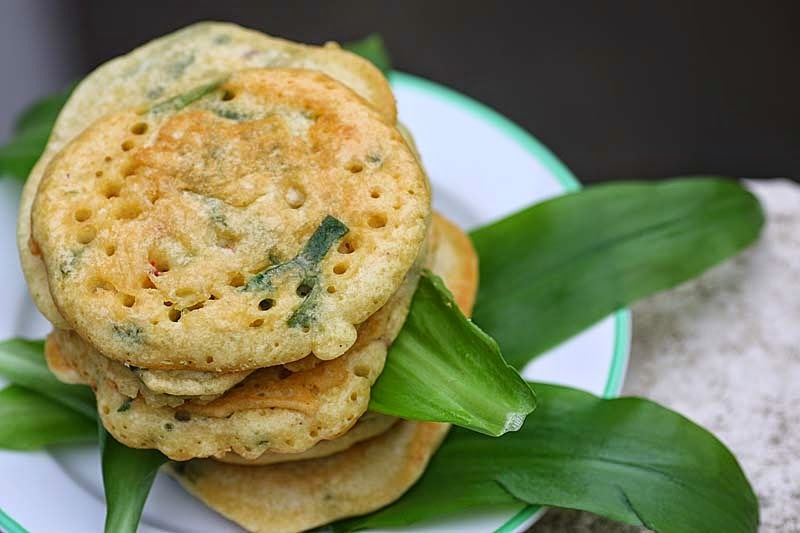 I am trying best to create original and different portable vegetarian and vegan dishes, as well as cakes that no-one else is selling at food markets. 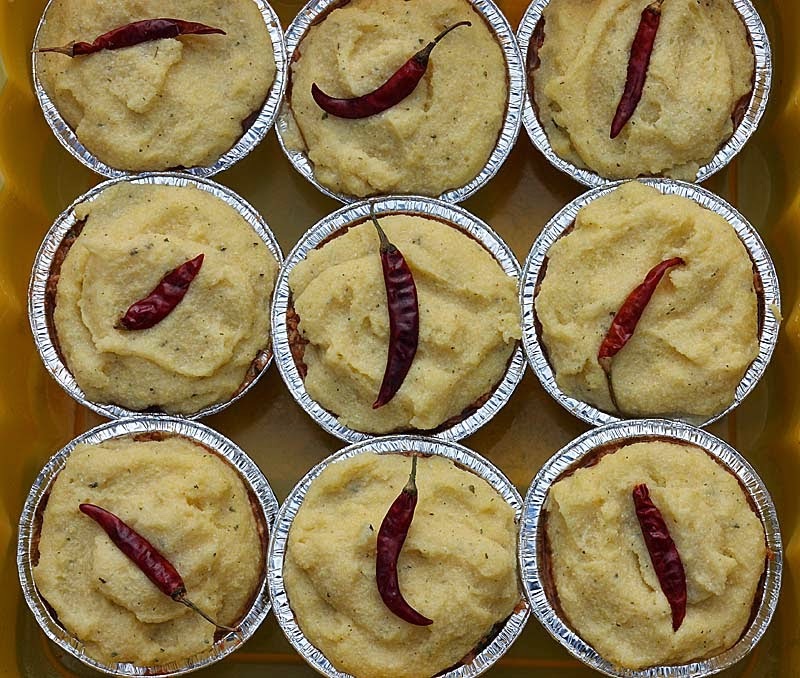 Well one of the original pies that I have recently introduced has been these individual Mexican Tamale Pies. There are lots of Mexican Pies about encased in pastry, but not like this one. I've been describing these as a Mexican version of a Sherpherds Pie - soy mincemeat base with beans and topped off with a creamy cornmeal topping. And to make them more appealing to the eye, I have topped them off with a dried red chilli. Unlike my other pastry pies, I do-not advise on eating these cold or even at room temperature, but to take home and re-heat in the oven (or microwave if you so wish). Today, these sold out. They sold out last weekend too! One of my customers is from Mexico and she has given it the thumbs up, saying she is neither vegetarian or vegan for that, but these vegan Mexican Tamale Pies mimics the real thing she is used to back home real good. A good compliment don't you think?! 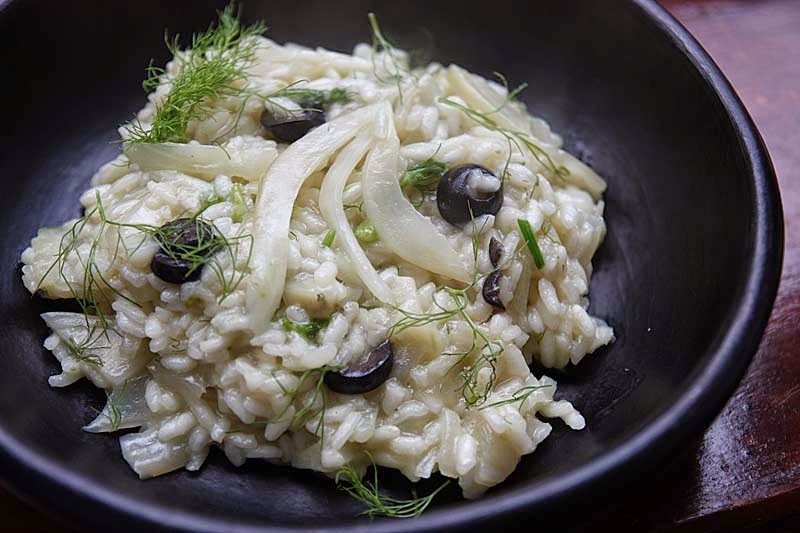 If you wish to see the filling, please follow this link where I have made this very same recipe in individual serving dishes. 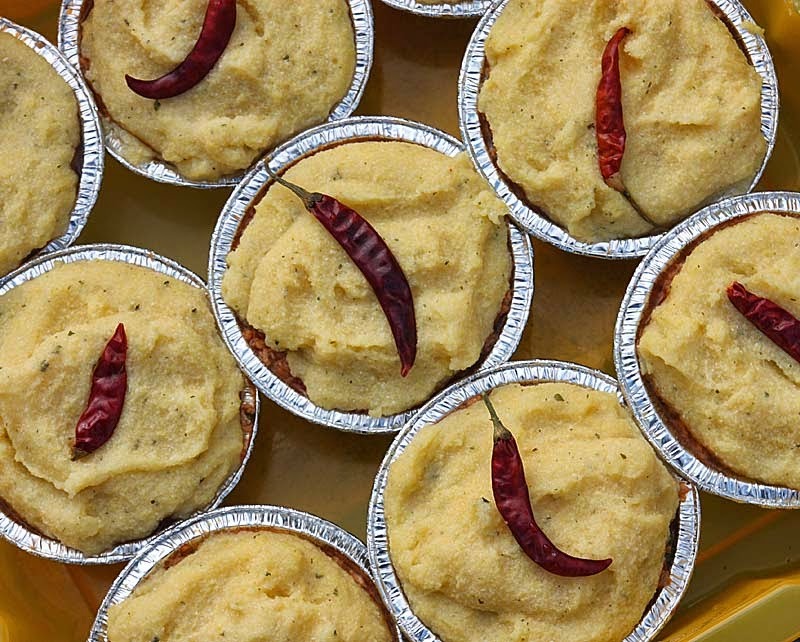 I am sharing some of these individual Mexican Tamale Pies with Vanesther at Bangers and Mash who is hosting Mexican Month on the Spice Trail - Ariba Ariba!. 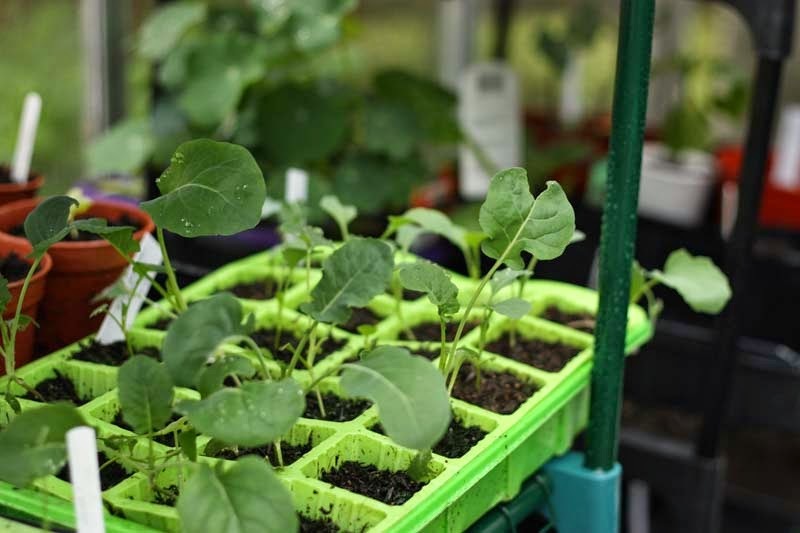 Early in the month I showed you my new growing space - click here if you missed that post. 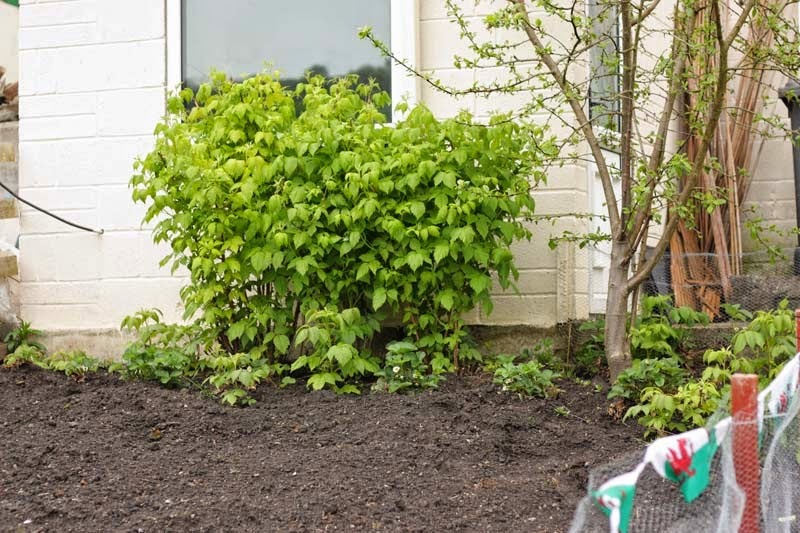 I dug this front part up a couple of weeks back and out of nowhere raspberry stalks have sprung up. 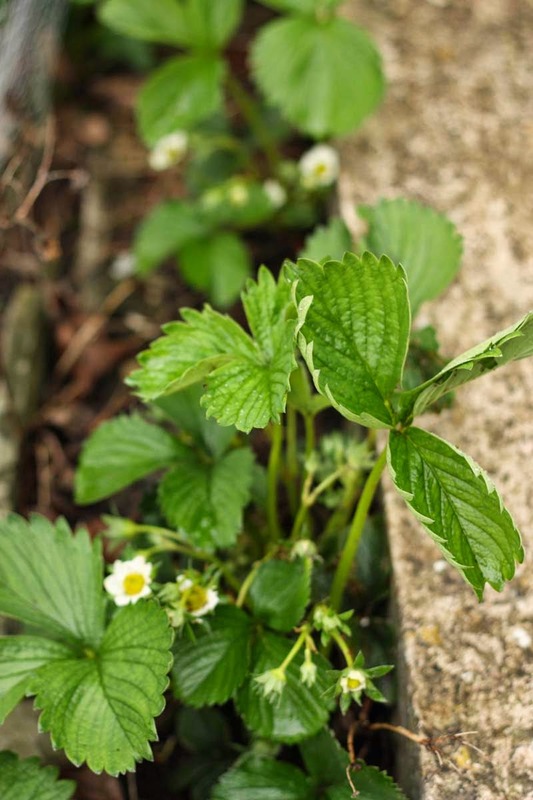 Too many in fact, that I am trying to control them, as I want a vegetable patch, not a raspberry garden. Here is the garden from the top end. 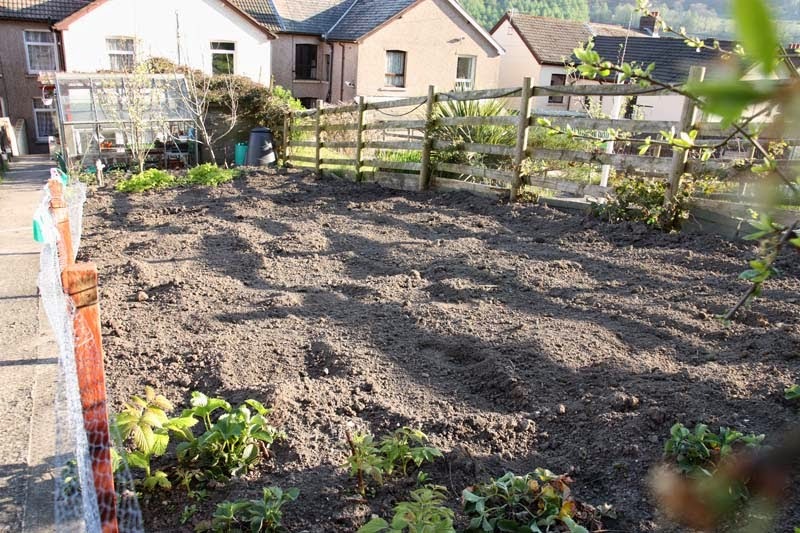 I started the weeding and digging, and D finished it off just a few hours back. He's going to have a sore back tomorrow, its been a long while since he dug the ground. 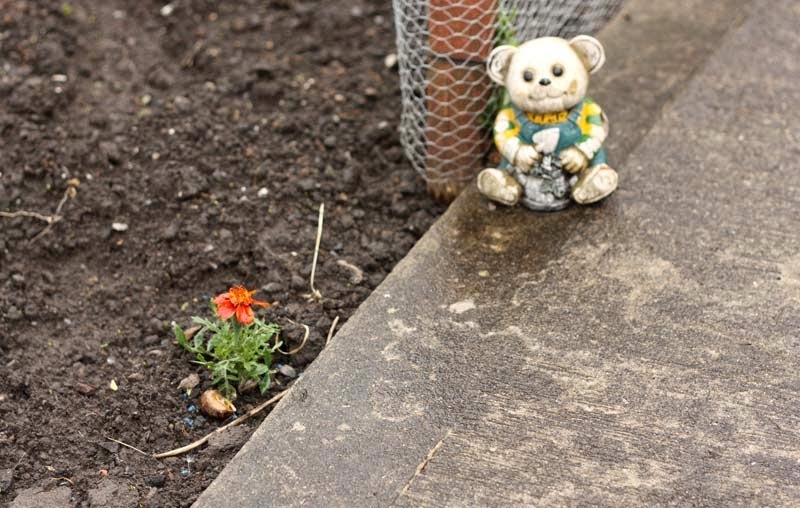 Like me, he is very excited to be growing fruit and vegetables again, but for him - its the greenhouse - he wants home-grown tomatoes. I think he will get some, but not in the quantities he's grown in the past (see here) - slowly slowly we will get there once again. 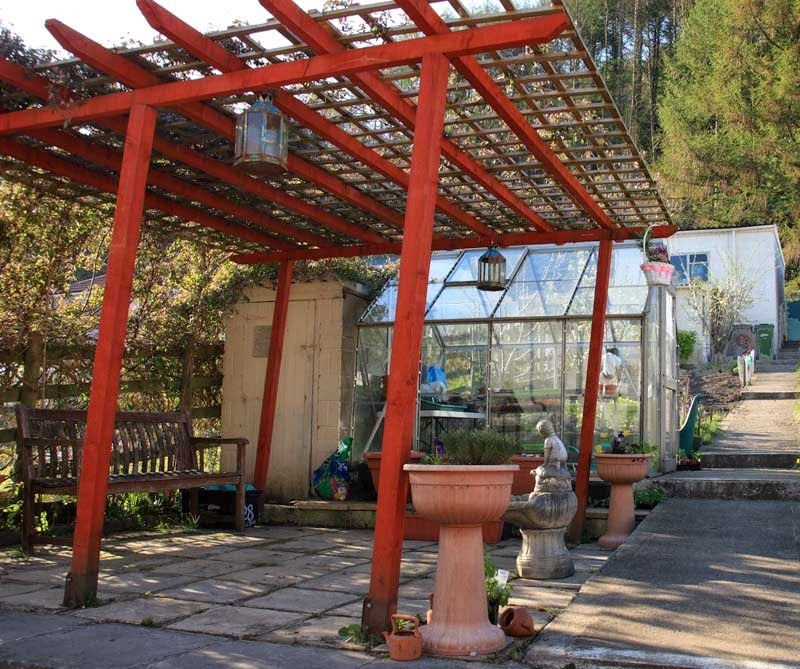 You can see the greenhouse at the front. 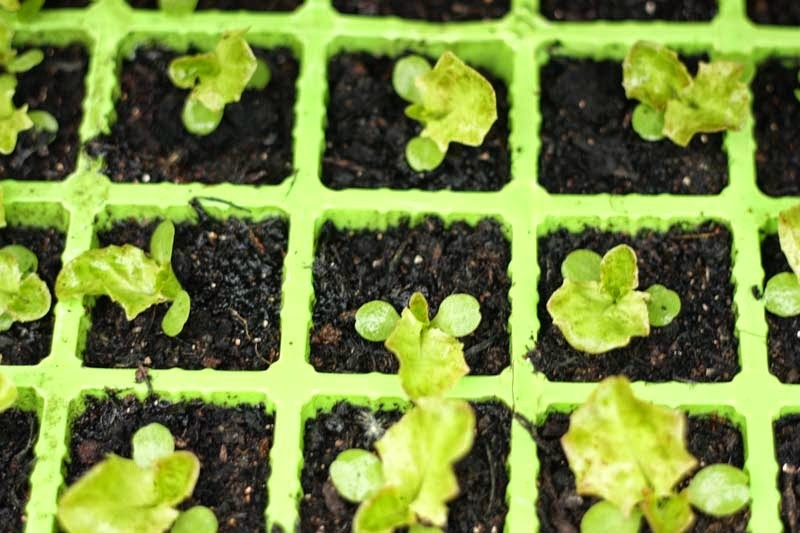 Lots of seeds are sprouting, including tomatoes! 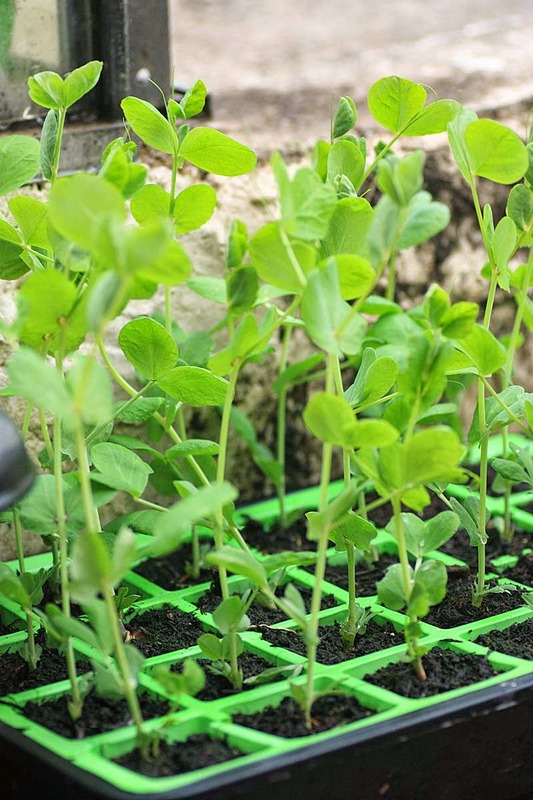 Below we have some sweet peas that are crying to come out of the seedling box. We will be building wigwams tomorrow for them to climb up on. Oh something I did not show you in the previous growing space post, is our pergola, makes me feel oh la la. I love it - but D has other ideas. Because the strong gusts of wind early this year, the pergola has been given a good battering. Its not straight, so he is thinking perhaps removing it next year. 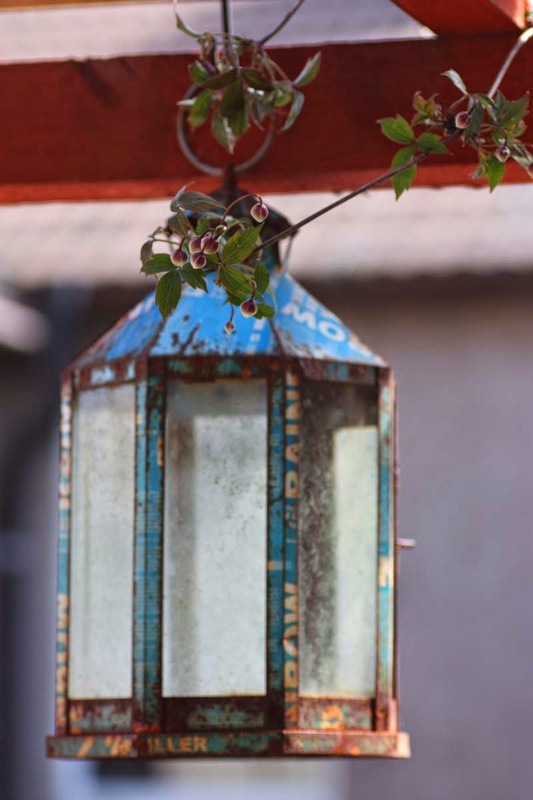 And finally, somewhere for me to hang my recycled lanterns - I brought these withe me when we moved from Glasgow. 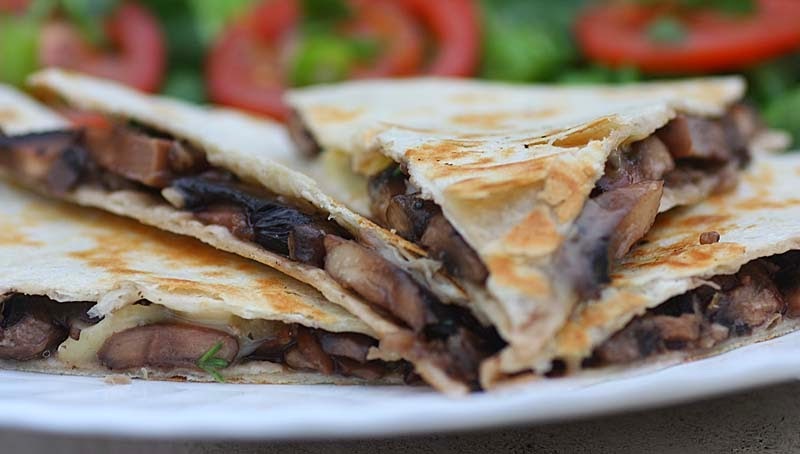 Some of you already know of my home-made Garlic Mushroom and Parsley Pies, but another dish that makes the most of garlic and mushrooms are these Garlic, Mushroom Quesadillas. 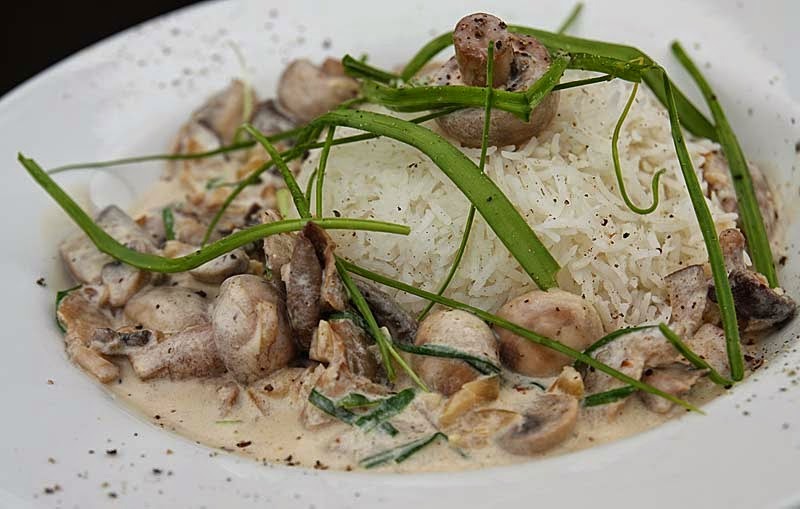 This is such an easy peasy recipe knock up when the hunger pangs rumble. I've used Brie cheese here, like cheddar cheese it tends to be in my fridge, but feel free to use whatever you like - a strong blue cheese would work well, as would oozy mozzarella. 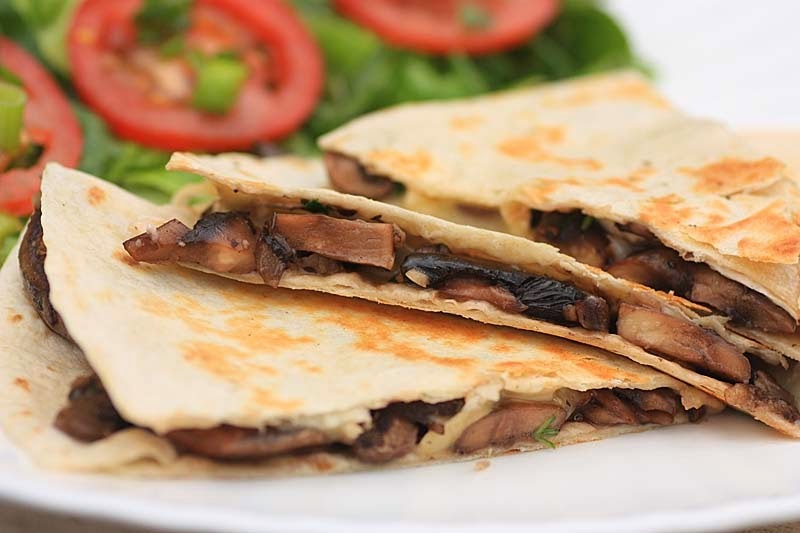 Well early in the week, there was not much in the house to eat in the way of fresh vegetables, except for some mushrooms starting to look a little tired and an open packet of tortilla wraps that were beginning to go hard as I had not wrapped the packet properly. So this is what I made to eat as a light snack. Except it not a light snack when you eat a whole one! 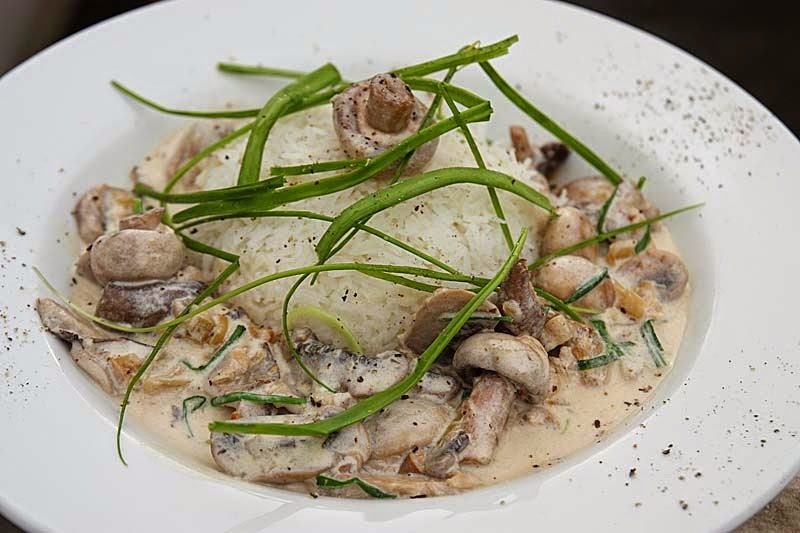 If you don't have any wild garlic, that's okay as the crushed garlic cloves in it would give you enough garlic hit. 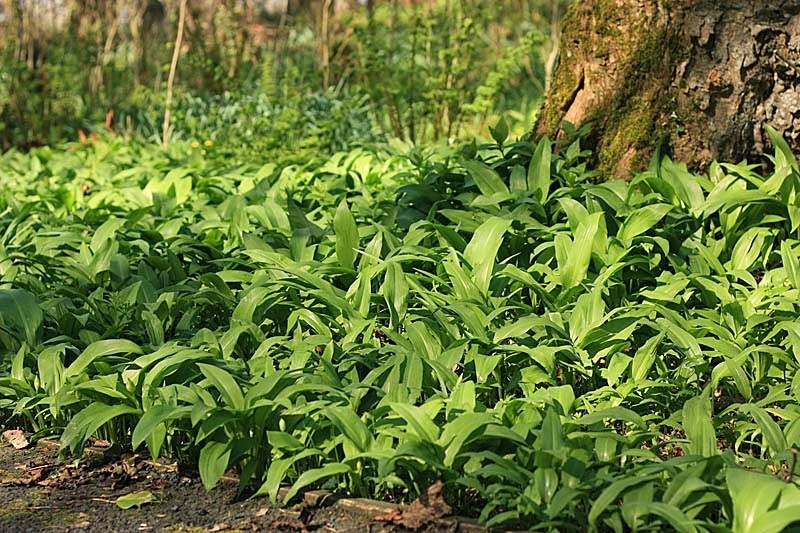 I've used wild garlic here for two reasons. One, I had some in the fridge and secondly for the green colour. 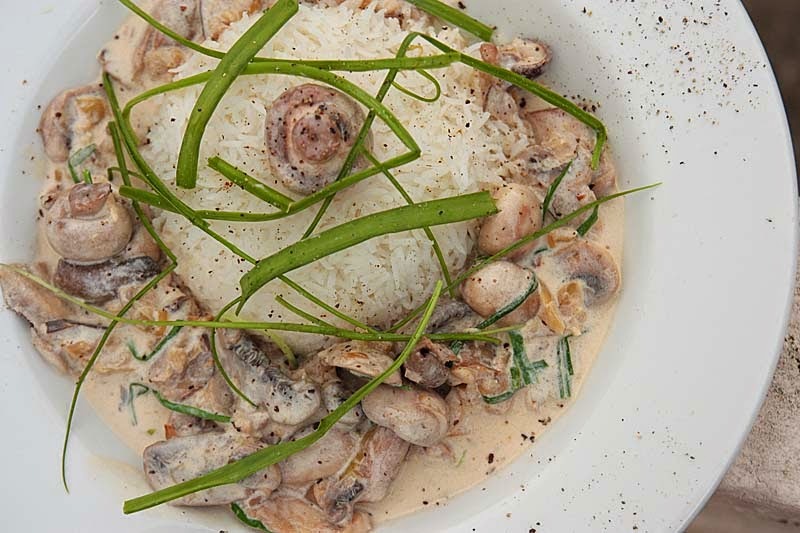 You must admit the colour of sauteed 'sluggish' mushrooms is not always the most attractive to the eye. 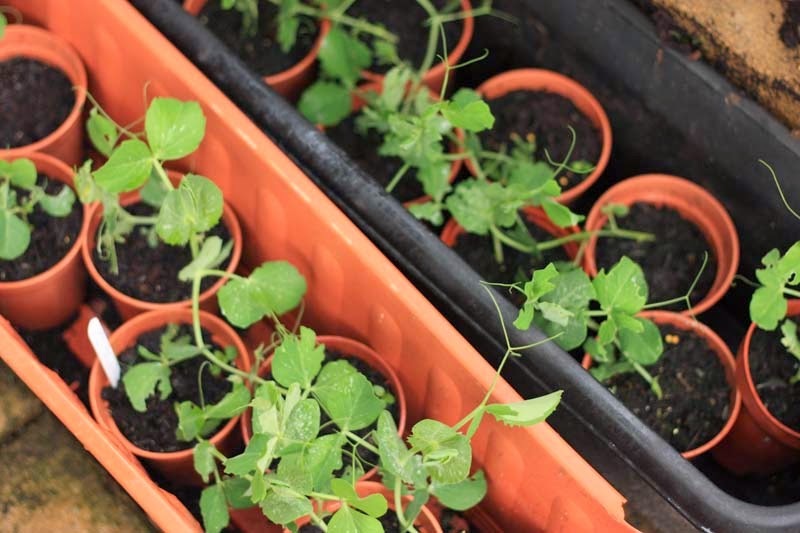 Seedlings are germinating, and the fruit trees are blossoming, herbs are growing - other than that there is not really much growing in my garden and not much being harvested other than the mint that is running riot in the garden plot. I am pulling it out, here and there and trying my best to control it. 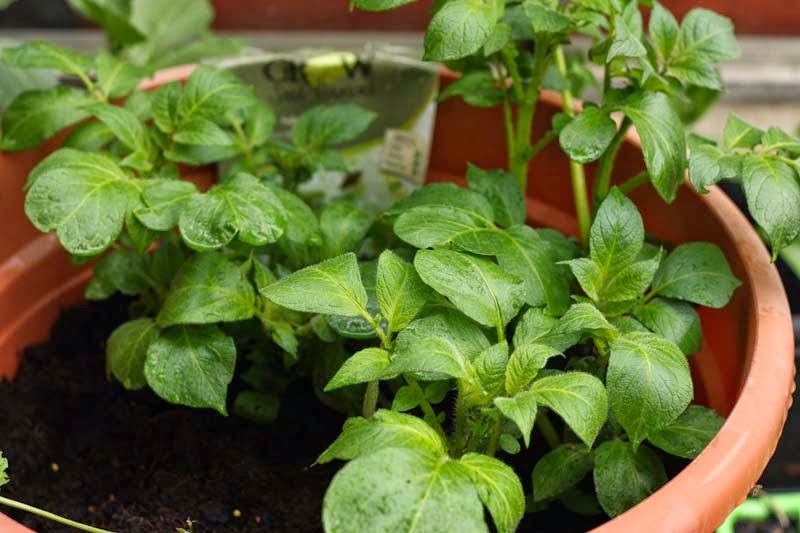 My mother dries her mint herb on the window sill and when dried she rubs them between her hands, so to remove the dried leaves from the stem. 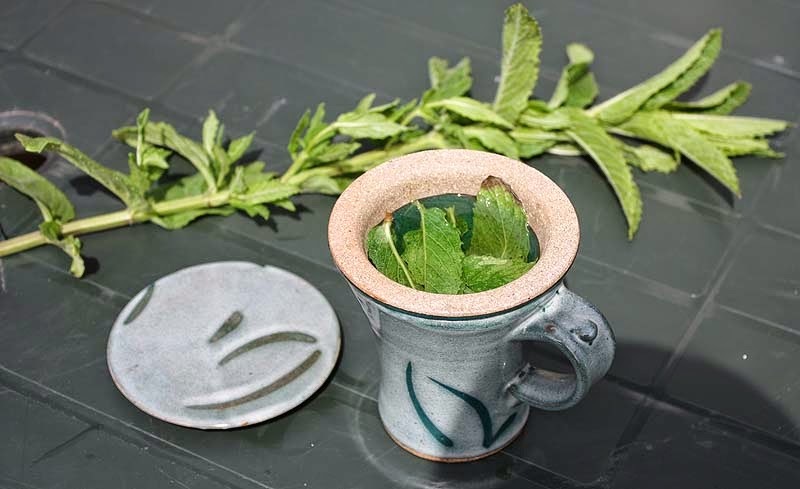 The dried mint herb is then transferred to a glass jar for when she wishes for some mint tea. Well, I have mint tea today, but its fresh mint tea enhanced with a little honey. Simples. 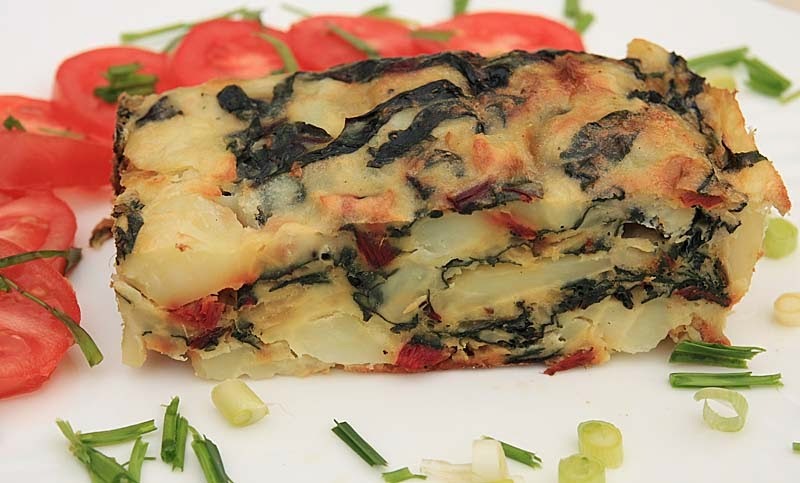 The thrifty and homely cook in me was able to create two dishes with the Swiss Red Chard. 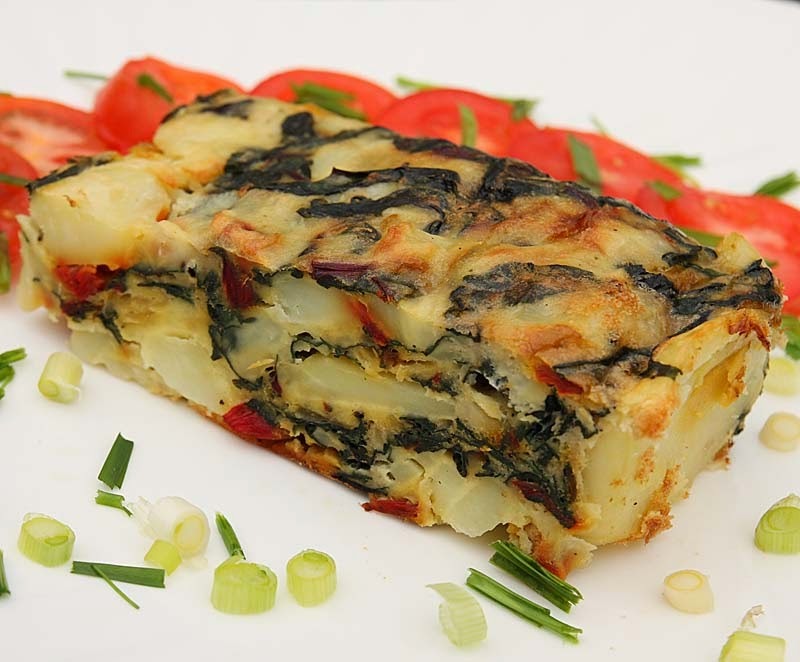 Today this Tortilla, yesterday it was a vegan Tart. 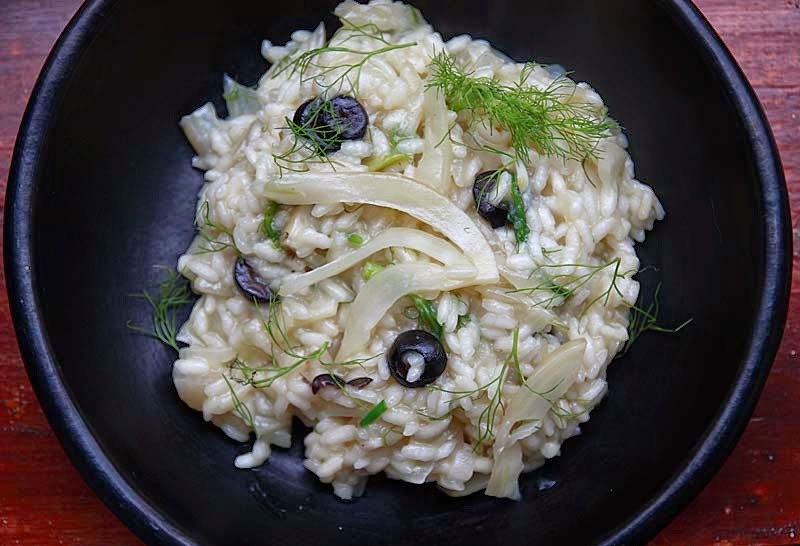 I like this kind of dish, its almost one pot throw all the ingredients in and let it do its work and its done. Its also very good to eat warm on the plate with knife and fork, or cold for a picnic or finger buffet as it holds well. 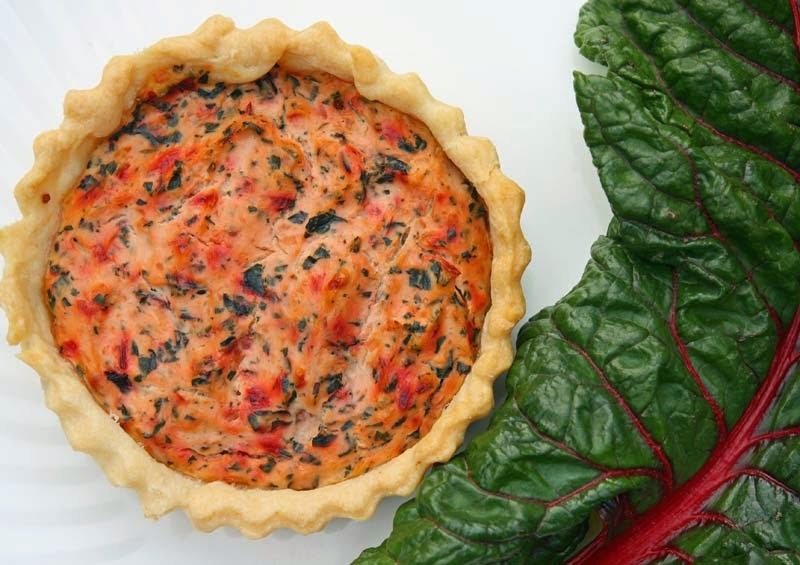 I also like how the red chard stems studs the tortilla. There's quite a bit left over, so we will both be lunching on it tomorrow. 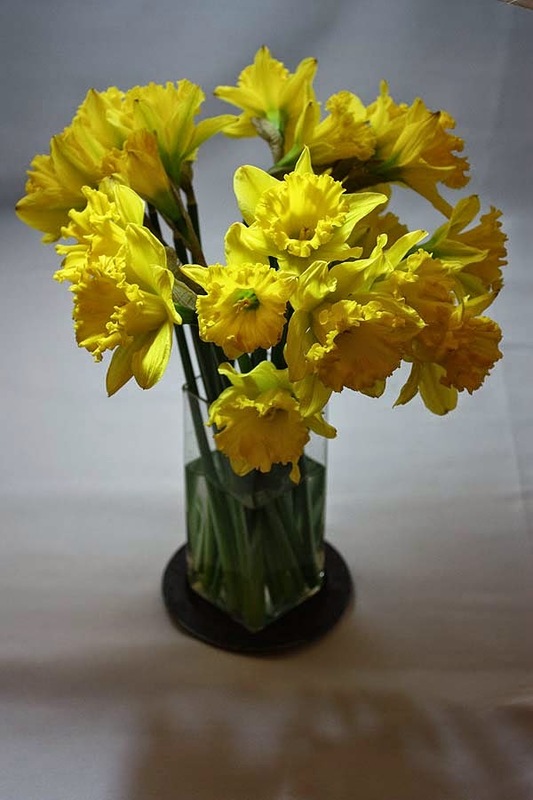 It been a few good years since I participated in Harvest Monday hosted by Daphne and Dandelions,that was when I had an allotment, but lots of things have happened since then that I would like leave in the past and move on. 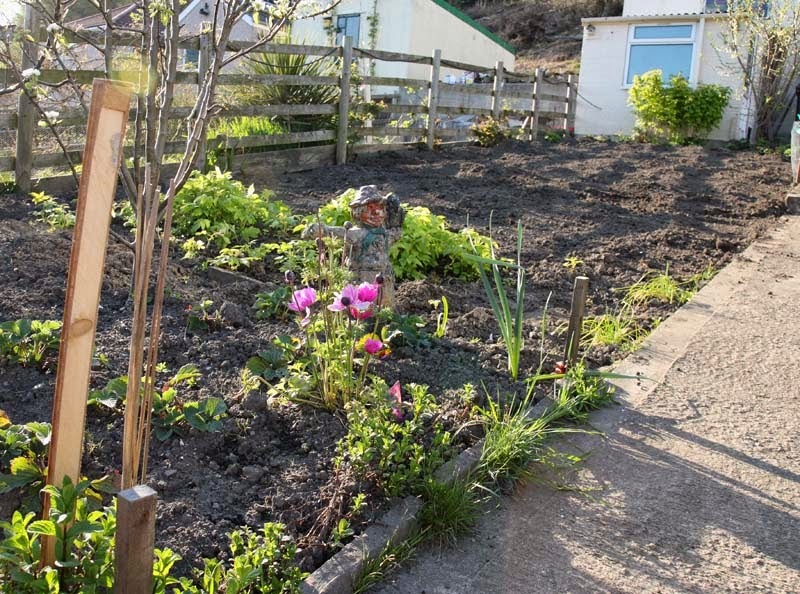 Now that I have a new home with a new garden (please see here), I am really looking forward to growing my own organic fruit and veg again; and sharing what's happening in the garden with other keen veg growers. 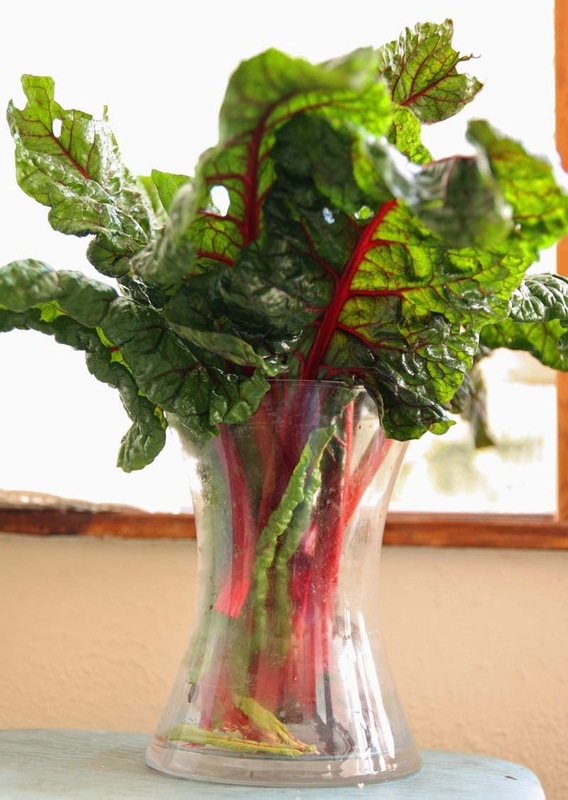 Today though I am cheating a little as the bunch of Swiss Red Chard that I am sharing have come from my new neighbours garden; and they were happy for me to have some as much of it was beginning to bolt. 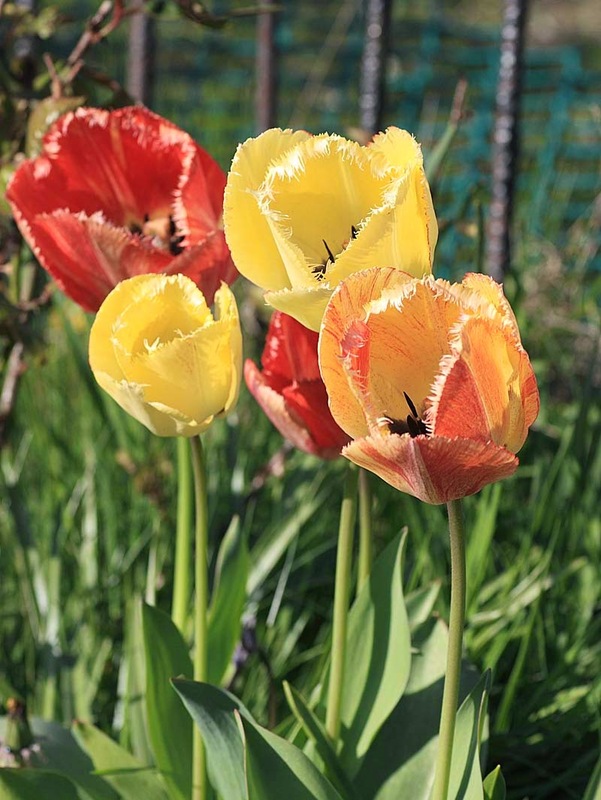 Sadly they are moving to Luxembourg for the work, such a shame as I was looking forward to comparing notes and some neighbourly veg growing competition and banter! 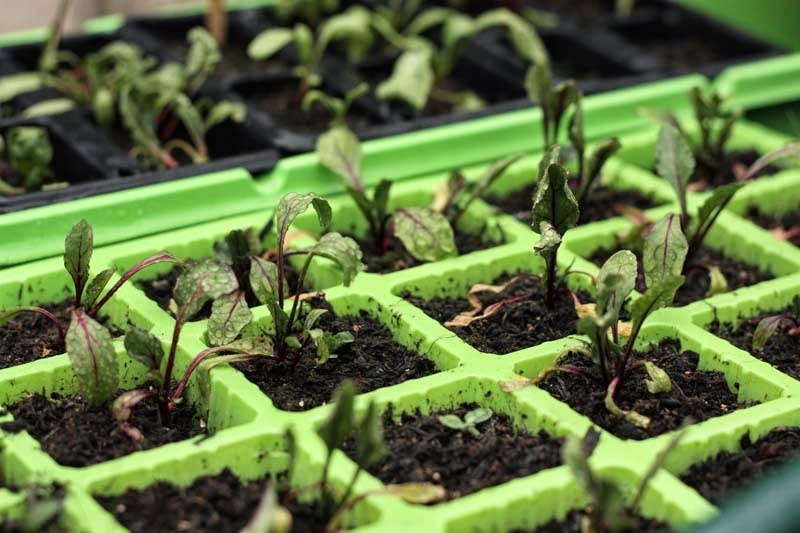 I've have a variety of Swiss Chard seedlings in the greenhouse that are beginning to emerge, so am looking forward to planting my own out soon. Oh yesterday I also went for a forage for wild garlic and came bag with a good bag full. 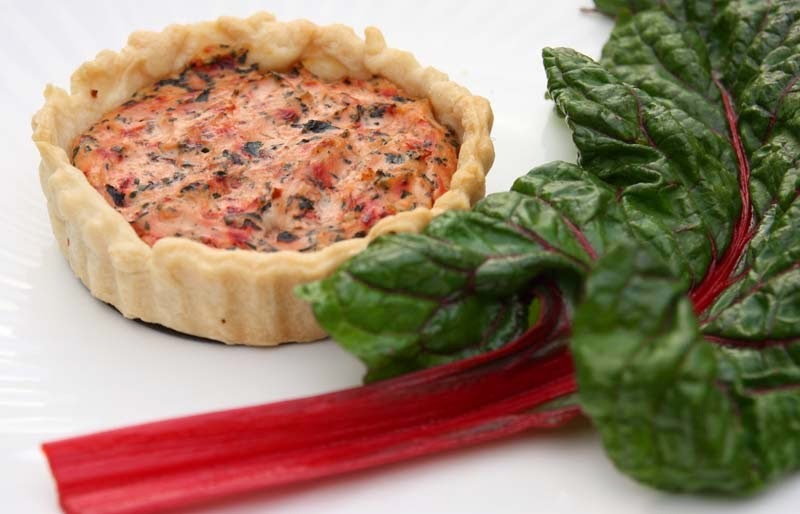 So expect some recipes from me soon, including Wild Garlic Quiche; Wild Garlic Hummus; Wild Garlic Oat Biscuits; along with some new ones. 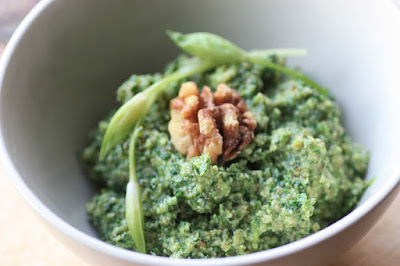 If you have some wild garlic recipe suggestions, please do share. I am always very open to new recipe ideas. I've given half the bag to my mother who has never had wild garlic. 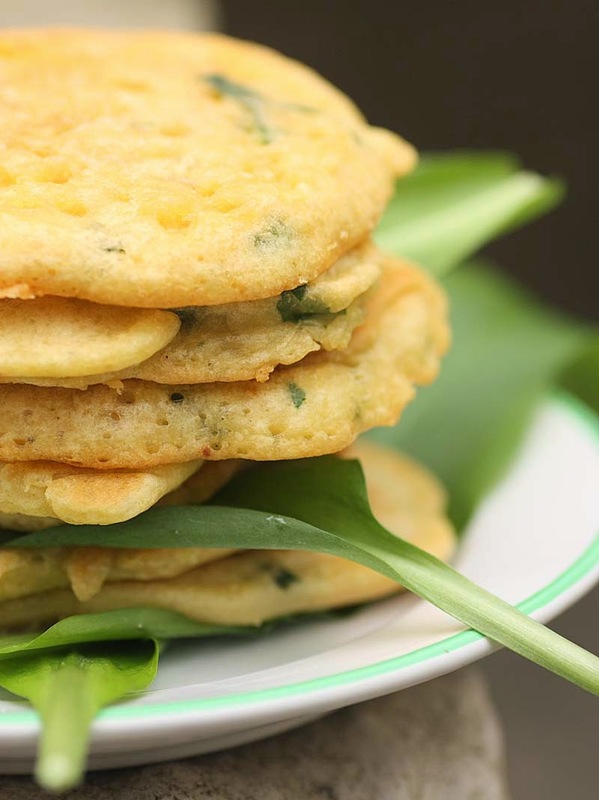 She said she was going to make some Wild Garlic Pakoras! Anyway, please come back later on to see what I made with this Swiss Red Chard and the wild garlic! 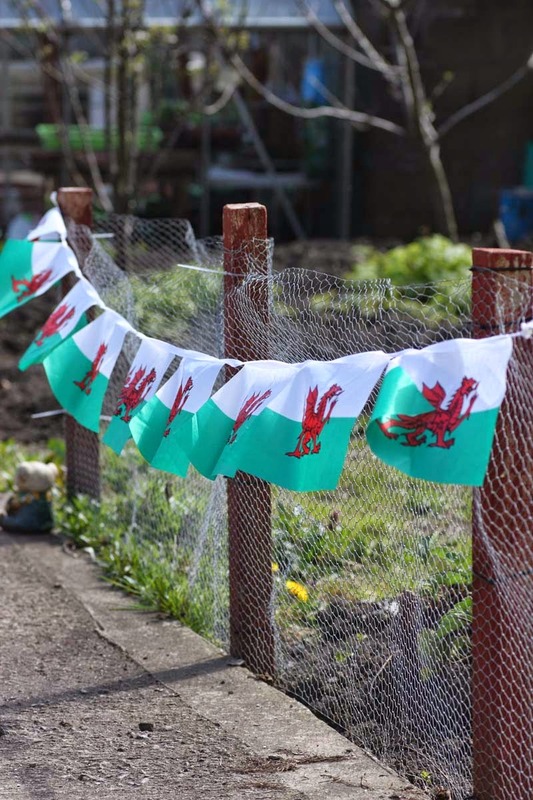 Having moved back to Wales to years ago into rented abode, I have to admit, as lovely as it was I hardly cooked in the that kitchen. as my culinary adventures got me cooking in a little independent eatery that I got to make my own for a year. Anyway, all that is past and I have moved home again, a little more deeper in to the valleys, but this time it is my HOME. I don't know if it will be my forever home, but it is home for now and I am looking forward to spending some good years here. Today I am sharing some new things in my kitchen, as well as some old that I have rediscovered. 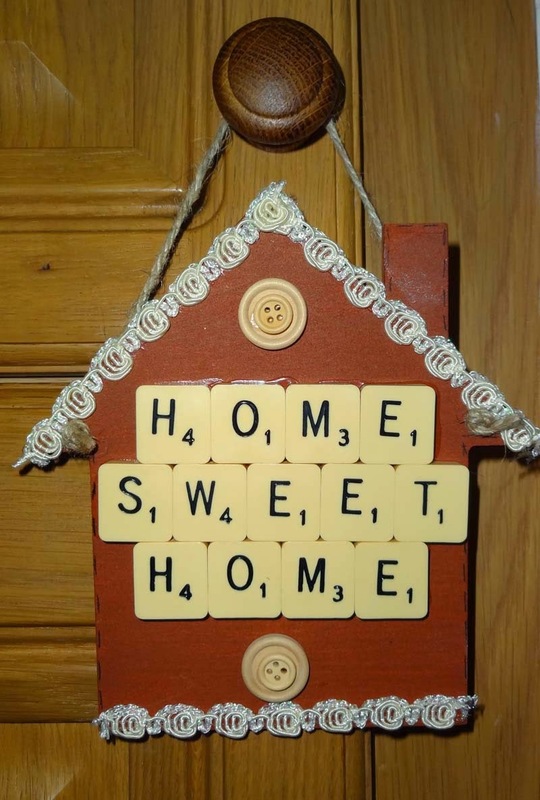 I picked up this handmade up-cycled scrabble board Home Sweet Home sign from a Craft Fayre last month for £3. It hangs off one of the kitchen cupboards. 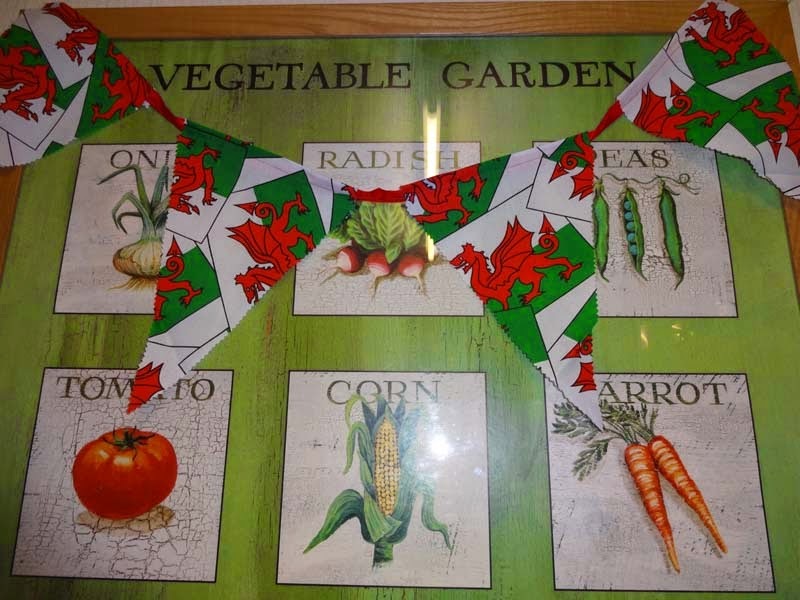 At another Craft Fayre, I treated myself to some Welsh Bunting made with fabric - its about 12 foot. I would like to use it the garden one of these days when I am entertaining family and friends. 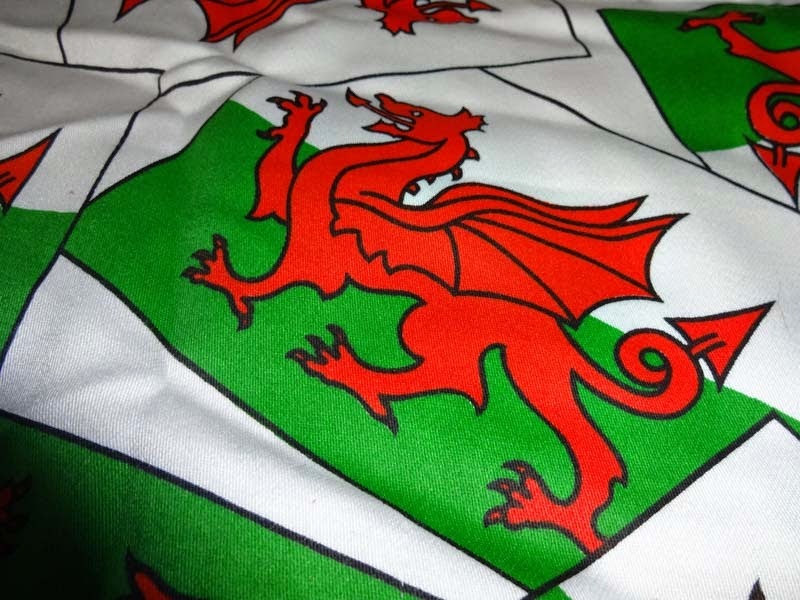 I also picked up a Welsh Apron. I promise to take a picture of me wearing it in the near future. 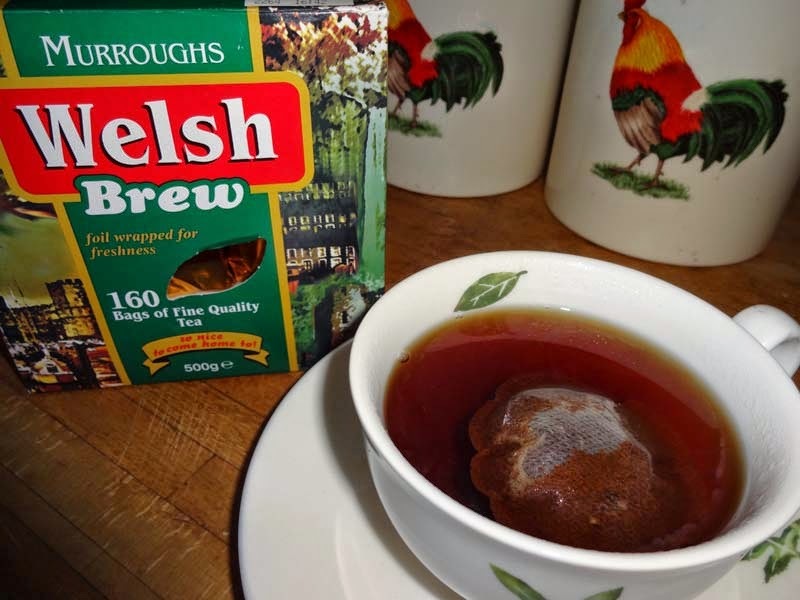 I'm trying to cut down on the morning caffeine, and have been trying to drink herbal teas, but recently I also sneaked in a box of traditional tea called Murroughs Welsh Brew to try - stirring stuff! 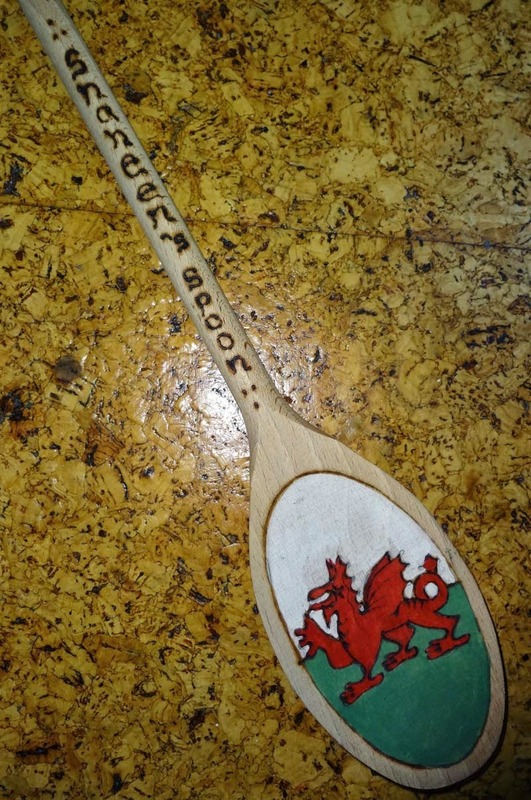 My nephew presented this Welsh Spoon with my name inscribed on it a few years back when I live in Scotland. It has pride of place in my kitchen. 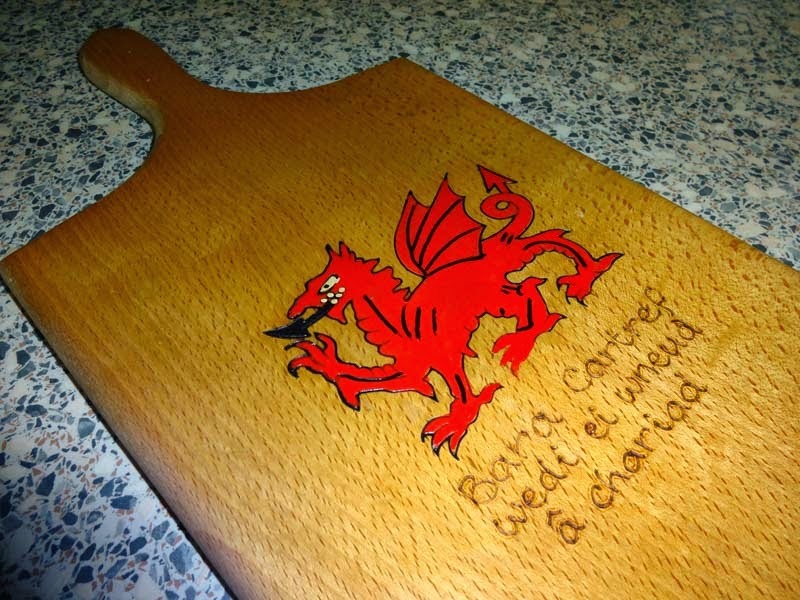 This Welsh Dragon chopping board has featured on my blog before, the Welsh inscription 'Bara Cartref wedi ei wneud a chariad' translates 'home-made bread made with love'. Above are some other Welsh gifts bestowed upon me by family over the past few years. 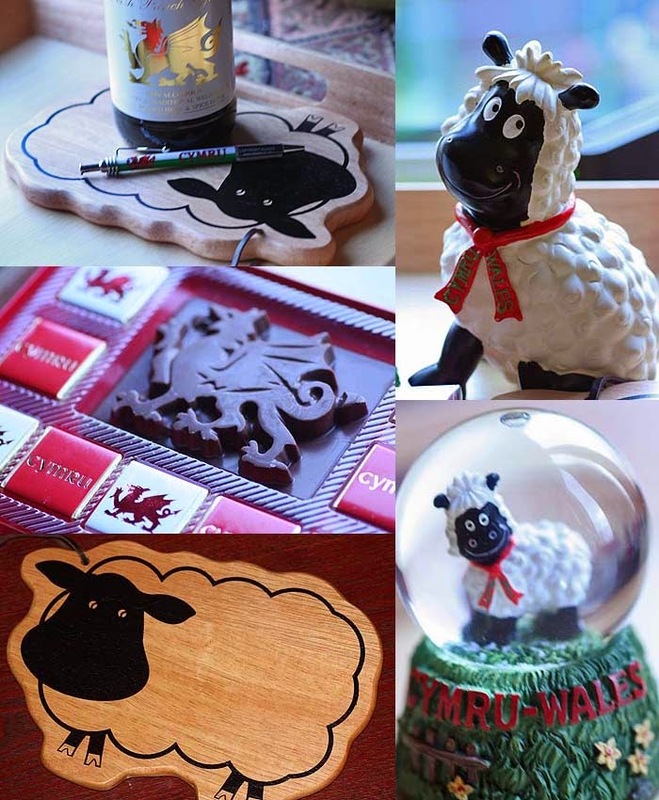 Welsh non-alcoholic Punch, Welsh Sheep Chopping Board, Welsh Sheep Money Box, Welsh Chocolate and Welsh Glitter Ball. In My Kitchen Series is hosted by Celia at Fig Jam and Lime Cordial. 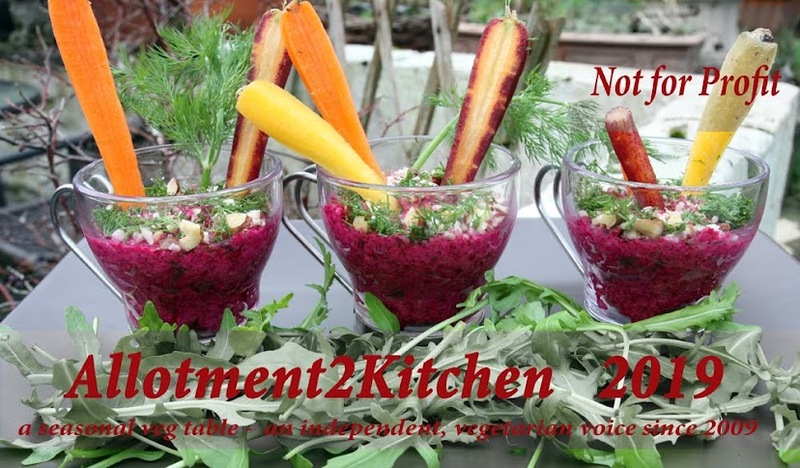 It is an opportunity for worldwide bloggers to share what is happening in their kitchen. 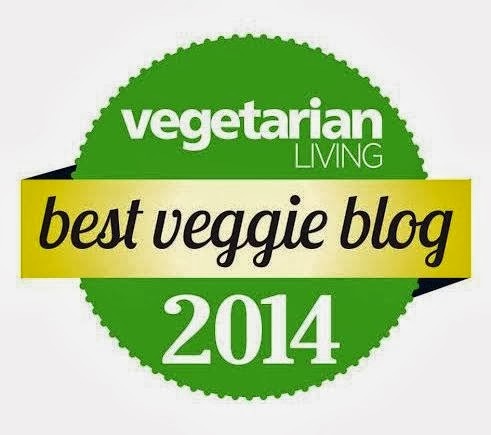 Please do go by and read about the other bloggers sharing what's going on in their kitchen - the heart of many homes! 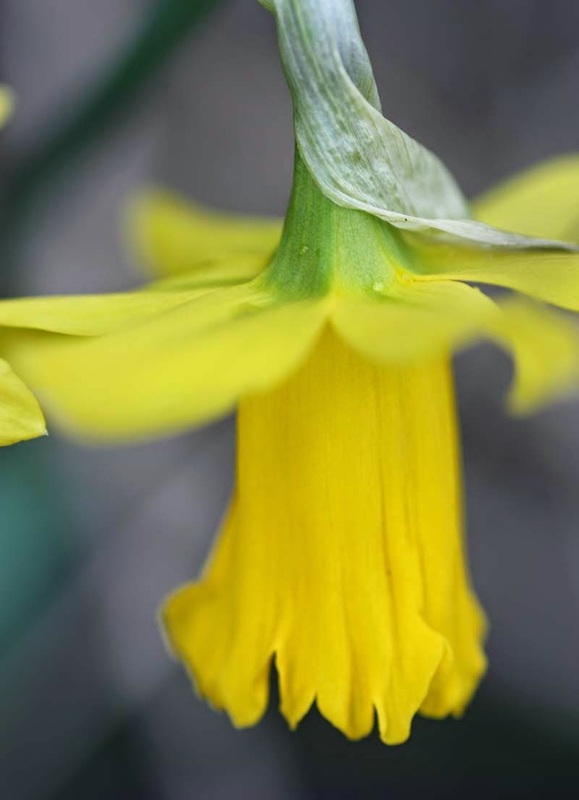 Oh I mustn't forget the daffodils, some on my window sill and some in the front garden.